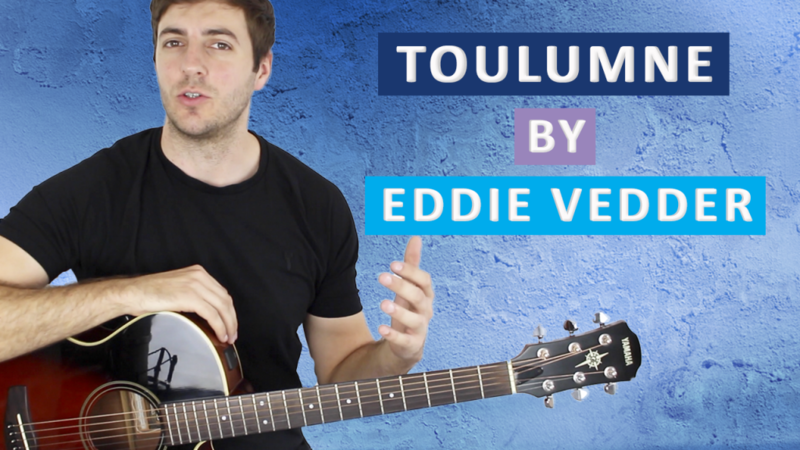 Scroll down for full video lesson (with tab) of Toulumne by Eddie Vedder. Toulumne was written by Eddie Vedder as part of the sound track to the film 'Into The Wild'. The song is just 1 minute long and consists of just one acoustic guitar gently fingerpicking through a very simple but very effective chord progression. The song uses a common right hand fingerpicking pattern throughout and has some very subtle and clever nuances in it. It's easy to miss these and to just play the pattern over and over, but you'll learn all these little changes in the video lesson. Toulumne is no. 38 on my Top 60 Fingerpicking Songs of ALL TIME list. If you've not seen the list be sure to check it out and sign up to my weekly email lesson. That way you won't miss learning any of these great fingerstyle songs. One of the tricky things about playing Toulumne is the speed of it; it's played at roughly 110bpm and it can be hard to cram in all the sixteenth notes into each beat. My advice (as always) is to take it slowly, to work on getting all the notes played as well as you possibly can and then to gradually start picking up the tempo. Try it along with a metronome to help you develop good timing and to track your progress.